Today, I'll be doing airport pickup duty for The Naming Project Summer Camp. Then, this afternoon, we head up to the pristine wilderness that is The Naming Project Summer Camp. I'll be on an island with 10 kids (and some other counselors). I hope you have a great week too! So, I've mentioned on here that I've started a non-profit. It's The Naming Project. Camp starts on Sunday...with kids! Camp Out comes out on DVD on August 5 (BUY IT!). Yes, the life of a non-profit founder is so glamorous, like I'm throwing cocktail fund raisers every other weekend for the wealthy. Let me tell you, it's NOTHING LIKE THAT. So far, this work has been "on the side" for the three of us who founded The Naming Project. We've handled responsibility as we have had time, or as the need got greater. The camp runs pretty smoothly now. We have good rapport with kids. However, there's this other side of non-profit work that no one ever thinks about. I certainly didn't think about it. Accounting. Tax reporting. Filing as a non-profit. Actually asking people for money. I have become the "business" person for TNP. I'm the one who does the accounting and tries to deal with the IRS. Luckily, we are a very small organization that doesn't deal with enough money to need to do a lot of IRS reporting. I didn't do a lot of accounting before this, and I'm learning as I go. Richard is coaching me. And the MBA classes are helping me to get a vision for what TNP could really do. But it's still hard. I still have other (paying) jobs that demand my time and energy. Also, there is raising the funds. I've written a few grants...most of them have been rejected. I'm not good at asking for money. I think that if someone believes in the mission of the organization, then they will support the organization. I've since learned that people need to learn about the organization in order to support it. Again, we don't need a ton of money to operate at our current levels. However, we have dreams to expand and grow. In order to do that, we will need to get more money (substantially more money). It would be great if we raised enough money to pay one of us to do the work of TNP. But we aren't at that point yet. Many good things have happened with The Naming Project. We've done some great ministry. But then there is the "business of ministry" that is a little harder to grasp. I'm not complaining, just processing (that's what blogs are for, right?). Any thoughts on the "business of ministry"? When I was younger (like, pre-teen), I used to love to go to malls. You would go and walk around and act all cool. Of course, I lived in a town that had a TINY mall. It was also half-empty, and one end of the mall was a Menards. So, it was not exactly the height of cool. But every so often, we would venture to Minneapolis to go to the BIG mall (Rosedale). It was the hight of coolness. There was a Spencer's Gifts (with "adult" gifts), and a lot of stores that looked really cool and grown up. Now, I'm an adult, and I live in Minneapolis. I don't like malls all that much. I mean, if I'm going to walk around, I might as well be outside (at least in the summer). I don't have money to spend, and I don't really need anything, so I don't go. And over time, I've learned to not like malls. I've discovered they are big temples to worship the god of consumerism. You can't do anything there that doesn't cost money. Walking around is only fun if you are 15 or maybe 65 and trying to get a workout. I've also learned to not like major chain-retailers (except ones my loving Other Half works for). Malls are outside of my experience. I had to go to a mall to get a gift. This was a specific gift, so I figured that the mall would be the only place that would work. I went back to Rosedale. It is definitely updated to match the new millennium, but it is not any place I want to hang out. Not only did I not find my gift, but I spent $2.50 on a pretzel. I would never had bought a pretzel in any other circumstance. But here I was, at the mall, not spending money. Maybe I felt bad for the mall, and that's why I spent the money on wasteful food. I also think the mall is much smaller since I was there as a kid. Of course, it has been expanded, but it seems smaller now that I'm bigger. This is going to be another one of those weeks that is filled with medium-sized tasks. There is no big event that is happening, but the week seems a little full. Of course, every week seems full compared to the restfulness that I've had over the last few weeks (did I mention that I'm getting a lot of sleep?). I have a test in my MBA program (which I don't seem to be studying for or worrying about...although I probably should do both). This MBA program is easier than I thought it would be. I'm not a business person at all, and I don't know much about management or technology, but I do know communications and sociology, which seem to be the basis for most of these classes. Tomorrow night is the last night of this class, which makes the test a final. I found the class pretty easy, but I'm not used to a test. It's multiple-choice, which is usually the easiest form of testing. However, I'm not sure how you take this discussion-based information that we've been going over for the last 7 weeks and put it on a multiple-choice test. Oh well, after this, we have one session of this "Executive Management" class where we talk about our feelings (sort of like CPE, for those of you who went to seminary), and then we get a month off. And I will enjoy the month off! I've been going through the financial records of The Naming Project. It was sort of a mess, and it probably still is. I'm hoping that we never get audited, but if we do, we don't deal with enough money to get us in serious trouble. Our account has never exceeded $10,000, so I think we will be safe. Then I realized that a grant deadline is much closer than I realized it was. There's a foundation that we applied for funds from early on in The Naming Project history. At first, they told us that they did not fund religious programs. Now that policy has changed, but then they said that they thought that we were asking for too much money that benefits too few people. That was a few years ago. Lately, I've had people from the foundation asking if I've applied. To be honest, I haven't because in the last few years, I've been too busy and missed the deadline. While I was going through TNP mail, I saw that a letter of inquiry is due by August 1. I'm thinking I can do that. I'll work on it this week. Speaking of The Naming Project...BUY YOUR OWN COPY OF CAMP OUT! Was that too subtle? On Tuesday, I am going to a meeting to evaluate Hearts on Fire. I've written about it on here. I think it was good, but there are definite areas for improvement. I already have a report prepared, so this is mainly discussing that report and the evaluation comments we got back. It's over lunch, and it's with friends, so it should be a good time. I'm calling this week a medium week, because next week is a big week. Next week is The Naming Project Summer Camp. We've still got about 10 kids coming (Our largest attendance is 12. We are hoping to break that record...maybe this year with a last-minute camper?). Last year, at about this time, I was imploring you to go to the LOGO channel to watch the documentary film Camp Out. 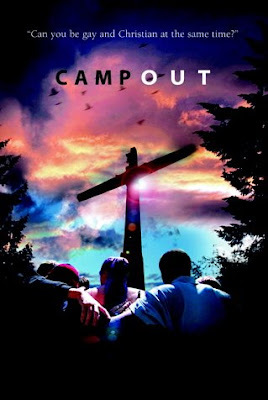 As you probably know, Camp Out is a documentary about The Naming Project Summer Camp, the program that I helped to found and still work with. I personally think that it's a very funny movie (it gets funnier every time I watch it) that has some good poignant moments. Anyway, last year we were excited because Camp Out was having its television debut. Of course, not many of you had LOGO (and probably still don't). If you really want to see the film, you can go to LOGO's web site to watch it in chapters. Thanks for going to watch the movie (or trying to). Now, I'd like to you to own this movie. Yes, Camp Out is now coming out on DVD on August 5. You can already order it from Amazon.com. So, if you are so inclined to enhance your video library, you can add in a film that features me singing (very poorly, in my opinion) by a camp fire and kids getting uptight over a game of truth and dare. BUY THE MOVIE! I also mentioned that our 5th camp is starting next Sunday. I'm pretty excited. Camp is always a good time. We have about 10 kids once again (we never get a firm number until the day before). If you are so inclined, you can visit our web site and make a donation to make this summer's camp a success. Someday, I'll stop promoting this film...no I won't. This is probably my only opportunity to be on television and on a DVD on Amazon. I'll promote it until I die. Our house is crawling. I'm finding their crap everywhere. We need to rid the place of these little beasts. A friend of ours is getting her first call in a church in central Minnesota. While she moves from Chicago (where she went to seminary), we are watching her cats for her. They've been in our house for over two weeks now, and they will probably be here for another two weeks. These cats disappear for the better part of a day (we don't let them outside). They like to sleep on dangerous shelves. They feel the need to be on any surface that appears horizontal, whether it's the counter top or a stack of tippy boxes. Everything has fallen off the shelves. 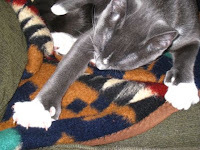 They jump out of their litter box and track litter all over the carpet. Augh! Do you remember when I talked about how sad I was when we let Alfred go. I'm not going to feel this way about these little creatures. I won't cry. I won't miss them. I won't be upset that my house is clean and quiet again. In a way, this is good. Richard had been talking about how we could get cats, because they are much easier to care for than dogs (can you tell that he's a cat person?). Now that we've had these creatures in the house, he is done with cats. He won't be seeking any more once these are gone either. I'm not a cat person, and this is not helping. I've had the feeling that there is something missing from my blog lately. Postings, you say? No, it's not that. As I scroll down, I see that the past picture I put up was of some dancer at a recital. Not my goddaughter, mind you, just some kid I found on the internet to garnish my blog. OK - it's the Sesame Street characters, looking all thug-like. I just want you to know that I passed by two other images because they were even less "family friendly" (I need to do a readership poll to know who's out there...seriously). I have to confess that this image really disturbs me. I don't want Elmo to be looking so evil. The biggest laugh I'm getting is that the name of the street has been changed to Scramstraat. Now that's a laugh. OK - let's find something a little less...evil. OK - this one still has a little violent streak in it, but it's much more funny then scary (thank goodness). I've never encountered a sand ninja, but I bet if I did, I wouldn't fare too well. I have a hard time running on the sand (which is why I was never in Baywatch), let alone fighting a ninja. I'd be a gonner for sure. Where do sand ninjas train, anyway? I'm just letting you know that this really cool photo of the sky couldn't load. I guess I have to stay with the evil theme. Not evil, but definitely falls under the "totally random" category. Yup, that's a penguin walking down the street. 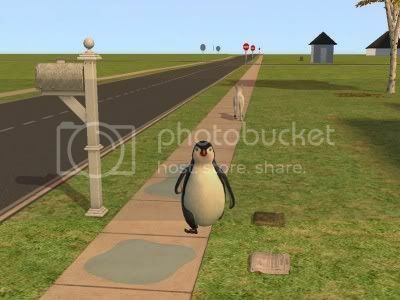 I'm sure there is a good reason for a penguin walking through suburbia (probably a zoo break). What I think is more interesting is that is appears that the penguin has just passed by a cat, and neither animal seems to have reacted at all. Apparently, this happens a lot in this neighborhood. Here we have a space rock that bears a striking resemblance to a manatee. Do you know why they are called sea cows? I don't think they look much like a cow. In fact, this doesn't look like a cow at all. It looks like a space rock, just floating out there, with a little follower. Maybe this is the asteroid that got blown up in Armageddon. Probably not. Last one, and then we'll end this crazy game (and leave it to the professionals, like Clint). Well, I see that we are ending on a cartoon that looks like it came from the New Yorker or some fancy-schmancy magazine. Just so you know, I get the joke. If I didn't get the joke, I probably wouldn't have included it in the blog. I want to look like I know what I'm doing in this thing. I mean, my readers trust me to give them nuggets of wisdom and pearls of happiness, so I must deliver. If I put something up there that makes no sense (like a baby with a distorted face or children's characters posing as gang members), then they would totally lose confidence in me. I'll give up now. You know that I barely know what I'm doing in real life, much less on the blog. I feel like I just finished my first week of summer. I know what you are saying, "Doy, Ross, summer is half-over." But I've been preoccupied. First, you need to understand that I LOVE summer. It's my favorite season. When the days are shortening in the fall, I miss the long, slow summer days that have just ended. When winter dumps another 8 inches of snow on us and bites us with wind-chill, I long for the days when I can walk around in shorts and a t-shirt at night and be comfortable. When spring begins to get lighter, I wait in anticipation of a time when it will be light out until 9:00 at night (at my latitude). Yes, summer is a special time/place for me. I like light. I like warmth. I like a different schedule than I have between September and May. But I haven't noticed it much this year. I've been too busy. Busy preparing first for a Youth Theology Institute and then for Hearts on Fire. Both of these projects were all-consuming. I spent my days at a desk, or on the phone, or in a room somewhere. I didn't go for walks. I didn't sit in the backyard. I barely mowed the lawn. And now it's over. I don't have a project that is taking all day and all night. I was able to take a walk this evening. I walked by the park, and I noticed that they filled the pool with water. I hadn't seen it before. Of course, they always fill the pool in early June, but I didn't witness it. Maybe it's also because I don't have a dog to walk around several times a day. The walk was lovely. I enjoyed being outside. I have enjoyed having a relaxed schedule, for a while. I'm enjoying summer...and it's half over. I still have TNP Summer Camp in a few weeks, but since that is at a camp, I think I'll appreciate being outside while I'm there. I just need to BE in summer. I hope your summer is going well! Usually, I complain that my life is really boring. Not so today. Since being in San Francisco for two weeks and not getting enough sleep, I'm happy to be at home doing mundane things. I've been doing accounting, entering receipts into Quicken. I've been working on papers that need some work. Soon, I'll have an excursion to go and pick up our vegetable share. Sigh, it's nice to relax. This is what I think summer is all about. Adventure is one thing, but relaxing is something else. I realized that I missed a lot while I was gone. A young person that I worked with committed suicide, and I was not able to be at the funeral...much less process with anyone else who knew him. I feel like I missed that death completely. I have another friend who is struggling with health issues. Being gone and distracted, I felt like it wasn't really happening. Now that I'm home, I feel like I can fully accept what's going on. I'm not distracted with programs, set-up, or gathering music. I can fully appreciate the difficulty that others have been going through. I guess it's emotional catch-up. Not really. My heart is still flaming, but I've been sleeping quite a bit lately. Hearts on Fire is over. The Assembly was a success. I'm exhausted. I cannot survive on multiple 5-hour nights of sleep. I'm still tired from the experience. I really like doing this work. I even like the stress that I'm going through. Before, I compared working on an assembly to giving birth. I'm sure that women who have actually given birth might not appreciate the comparison, but that's what it feels like to me. There was a lot of difficulty and stress and panic while the Assembly was taking place. Now that it's over, I have only fond and funny memories of the experience. Now, I have other tasks to do back at home. I've let my mind get so consumed with Hearts on Fire, that I put off everything else. Now I'm back to working on everything else.